My boy’s team has been working on their robot and it has been working all fine (high hang) until last night. When we lift the arm for high hang, it skips gear and the robot keeps falling down. It’s only 2 days away from the provincial and he doesn’t know what to do. He replaced some of the gears and attached with a new shaft (saw some thread said it could be gears worn out) but still doesn’t work. He even try to “align” and make sure the gears are align before he high hang. Can someone please help and take a look? Much appreciated!! 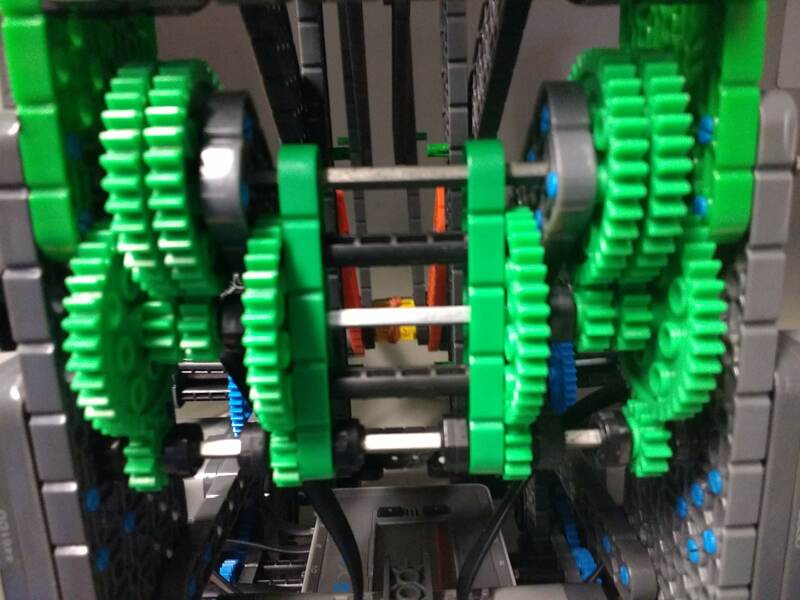 These gears were slipping as well and the kids added in the green 1x5’s in the middle. Believe it or not, the steel shafts bend, and they only need to bend a little to make it skip. @mokmaggie More gears and fixing alignment should keep it from slipping. thank you. may i ask what gear ratio is this? would the slip cause by not enough torque? 15 ► 1 is what they run. Thank you so much! May I also ask about your robot speed? I saw your other thread that you were able to get 19 points in 45 sec. my son did the programming and even try to optimize anywhere he can but it’s slow. We are over 1 min. Did you use multiple gears for your wheels? Thank you! @mokmaggie 100 on drive, but it is all about efficient movement. It took my kids about 3 weeks just to figure out the best path. 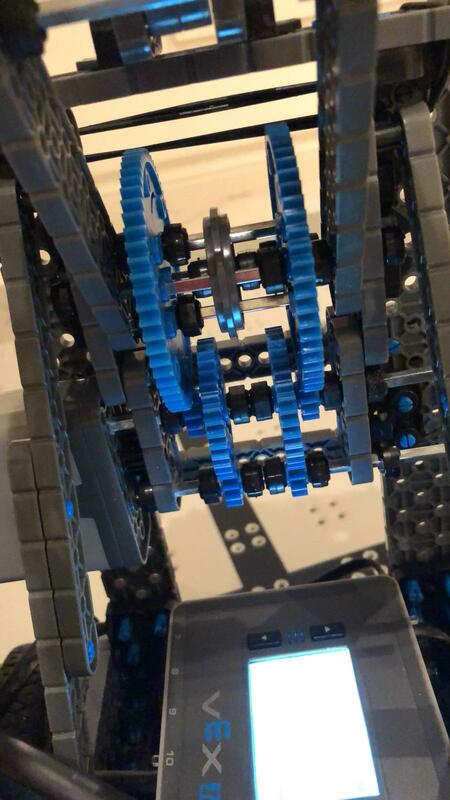 I’ve found that double gears next to each other liken in @sankeydd picture is better than @Sean8349 since the movement of the gears will mesh with the ones next to it. 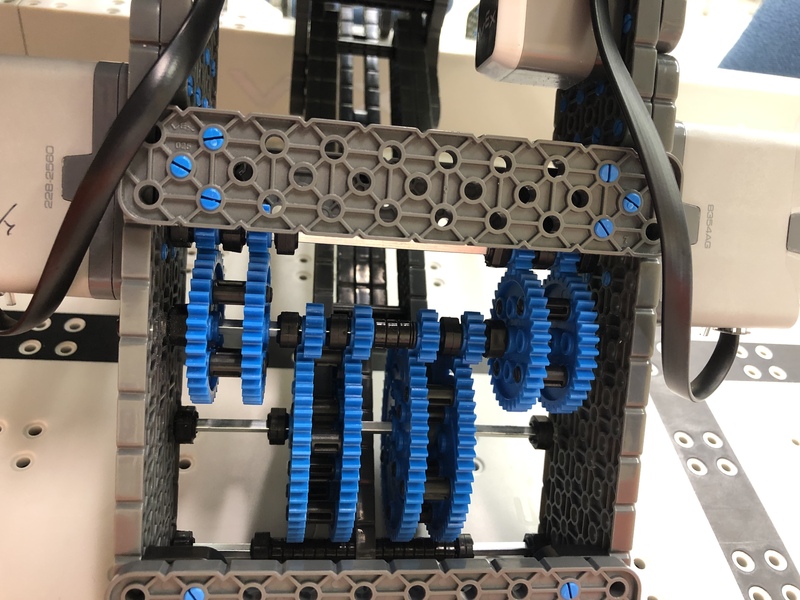 OTOH I’m in AWE of the gear train shown by @Sean8349, with all the spacers and the plethora of stoppers.